Occupational Therapy, or OT, is a term describing a medical profession that works with people with disabilities or those who have experienced brain or bodily trauma. Treatment or therapy is often necessary for those with common diagnoses of stroke, heart problems, brain injury, burns, or other injuries. Therapy enables individuals to participate in meaningful activities relevant to their daily lives. For example, occupational therapy often involves training of self-care skills such as dressing, bathing, tooth brushing, shaving, hand and hair washing, and feeding skills. An occupational therapist teaches and assists the patient in becoming as independent as possible with all daily tasks. Children make up a large part of the population receiving OT services. Children who receive services have a range of diagnoses that may include learning disorders, autism or Asperger's syndrome, cerebral palsy, Down syndrome, brain injury, attention deficit hyperactivity disorder (ADHD), genetic disorders, or general developmental delays. 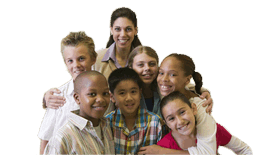 These children may receive OT at school, home, or in clinical settings. Treatment focuses on improving a child's developmental stages, play skills, social skills, and oral skills. Children that have developmental delays, physical disabilities, or a sensory dysfunction may be given a referral for an OT evaluation from their pediatrician or educator. An initial OT evaluation involves administering a series of tests over a period of 1-2 hours. The therapist uses a combination of clinical observation, standardized tests, and a parent interview to determine if a child is demonstrating significant delays in order to qualify for services. Following the evaluation, a parent-staff conference is set up to review the evaluation findings, establish treatment goals and objectives, and obtain written permission from the parent and doctor for therapy. Therapy focuses on a sensory or motor approach or a combination of these approaches to improve a child's ability to take in and use experiences of touch, taste, sound, and movement. Treatment also includes play and social skills, incorporating hand strength, grasp, cognition and following directions. Occupational therapists in school settings help a child develop and improve handwriting skills, visual skills, and social interaction, as well as academic skills. For example, treatment activities for a child needing help with handwriting may include a gross motor activity involving a sensory-based task or game, a fine motor activity, and then the actual handwriting objective. Gross motor activities involve the child in animal walks, peer games, and movement to music. Sensory-based activities may include writing or drawing in shaving cream on the wall, coloring on sandpaper, and finger-painting. Therapists use fine motor activities to strengthen hands and fingers by having the child practice pinching clothespins, stringing beads, and using chopsticks. Finally, the therapist makes an analysis of the child's seating position and choice of writing utensil. Writing practice and instruction helps the child focus on holding the pencil correctly, forming letters correctly, copying from a sample, maintaining left-to-right orientation, and using correct spacing between words. When your child begins therapy, communicate with the therapist as often as possible through notes or direct contact. More importantly, parents/caregivers need to help their child to continually improve his/her skills in the home or school setting. Therapists direct and teach a child the appropriate skills, but in order to have continued success, consistent practice of skills at home and in school needs to occur. This ensures the greatest success for a child receiving OT services.